Opito Bay is one of the most private, stunning and safest beaches on the Coromandel Peninsula (in fact it is one of the nicest unspoiled beaches in NZ) A beautiful safe spot for great walks, swimming, boogey boarding, diving, fishing and boating - Opito has it all. It is secluded and a fantastic place to holiday. 4 bedrooms (2 upstairs, 2 downstairs), 2 bathrooms,2 toilets, open plan kitchen / dining / lounge. Stunning views from decks on 3 sides of the property complete with BBQ, outdoor tables and umbrellas. Outdoor shower to wash off the sand. Large sized flat section with plenty of room for parking, over the back fence is farmland. Don't be surprised to see quails and tui's. Outdoor fish filleting facilities perfect for that big snapper or scallops! For those with mountain bikes there are some good rides and a number of lovely walks to neighbouring Crayfish Bay and Matapaua Bay. It takes about an hour to walk the half-moon shaped sandy beach from end to end. Opito Bay is a very friendly family orientated place. Sports Day is held on the beach every New Years Day with sandcastle competitions, gumboot throwing, tug-of-war and running races. The perfect spot for the family holiday. Located at the end of Black Jack Road, Opito is approx 30 minutes drive away from Whitianga and 40 minutes from Coromandel. The small settlement of Kuaotunu (at the start of Black Jack Road) is the nearest place for lovely coffee, pizza and the hugest ice creams ever! There is a local store there that is licensed to sell liquor and the very popular "Luke's Kitchen" for the best pizzas in the whole of the Coromandel! Opito Bay is paradise and a great location for all, whether its time away relaxing with the family and friends, soaking up the casual beach atmosphere or serious fishing and diving time out around Mercury Islands. All you need to bring is your own linen and food and you're set for a break in paradise. All beds have duvets and there are warm blankets in each of the wardrobes should you need them. Families only please. Rates are for a maximum of 6 people. $20 per extra person per night. Minimum stay is 3 nights. No tents allowed Prefer no dogs. Smoking allowed outside only. Please read instructions carefully as you are required to provide your own linen and do your own cleaning. We do not supply a cleaner, however we do leave cleaning products for your use. Definitely no parties or "events". NOTE: Under Kiwi bach tradition you are expected to: Clean the house and do the dishes before you leave; Bring your own linen (towels/sheets/tea towels); and leave the house in the condition that you found it in. Any breakages must be reported. The owners, Lynda and Kevin live in Hamilton New Zealand, but have holidayed at Opito Bay since it was built in 1982. This property has been in our family since it was built by my parents in 1982. 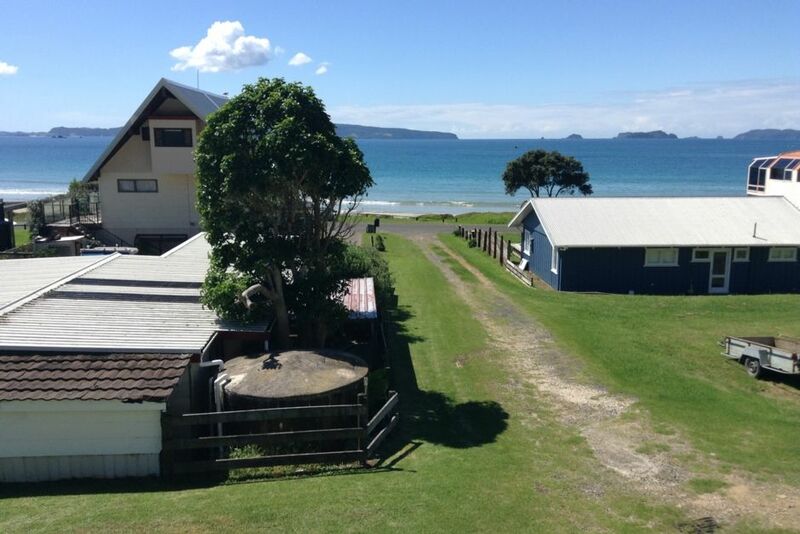 It is a good old "Kiwi Bach" with fantastic views and plenty of parking for your boat or jetski. There have been many years of fantastic family holidays spent at "Woodstock Inn" by 3 generations of our family, with many more to come! You can't get more relaxed than Opito Bay! The perfect spot for a relaxed holiday with great fishing & diving. Place was great, perfect beach side bach and amazing views. Property was as described, a good old kiwi batch in a great location, roomy with comfortable beds, good areas to sit outside on either end of the house and enjoy the view. Such an awesome place to stay - excellent views - great fishing, swimming, snorkelling for paua etc. Such an awesome place to stay - excellent views - great fishing, swimming, snorkelling for paua etc. and canoeing right there in front of the house - lots of bird life around - comfortable beds - saw snapper, kahawai, kingfish, baby blue penguins, paua, pheasants, rabbits, quail, grey herons and all the usual sea birds - would 100% recommend anyone to stay in this awesome location. Awesome classic batch with lovely views. Awesome classic batch with lovely views. Very comfy. Great Bach in a beautiful location. Great Bach in a beautiful location. Stunning views from both deck areas really well equipped kitchen with all the essentials. Fabulous holiday would love to stay again.